The Almond Flower: Gluten Free at Nats Stadium! Gluten Free at Nats Stadium! 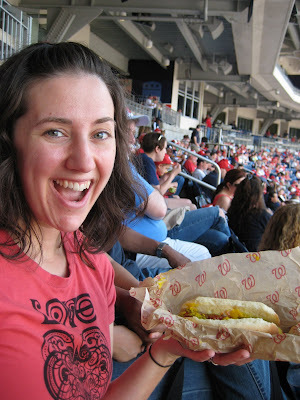 Gluten Free at Nats Stadium, can you believe it!? There is a social part of Celiac Disease in addition to the obvious dietary aspect. For health reasons, people with Celiac Disease need to avoid gluten. But food is such an integral part of our society, the impact of eating gluten free when out on the town, at other people's houses, at parties and at weddings is significant. I deal with eating gluten free socially by calling ahead to restaurants, bringing a gluten free dish to events at friend's houses, requesting a gluten free meal at weddings ahead of time and looking for gluten free menus on websites. I had heard that the Nats Stadium in Washington, D.C. had gluten free soft pretzels. I took a look on their website and found that they had an entire gluten free stand! Besides being surprised and happy to see that there were gluten free choices, it took a lot of the stress out of attending the game. We went around lunch time and instead of worrying about eating ahead of time or packing a gluten free meal, I was able to relax and enjoy the outing, knowing I could partake in baseball-appropriate food with everyone else.